Jim Hudson Audi Columbia, located in Columbia, SC, will help you experience the progressive design, revolutionary engineering, and innovative solutions of all Audi luxury performance vehicles. As a proud member of Jim Hudson Automotive, family-owned and serving the greater Columbia area since 1980, we are pleased to offer our customers a full stock of Audi models that are packed with the performance and high-end featured you expect from Audi. To match the high quality and value of the Audi line-up, our talented team makes customer experience the utmost priority. After all, shopping for a luxury vehicle, like a new Audi, should be just that - luxurious. Each member of our team is well-tenured, with a minimum of five years' experience, so they are best able to meet your needs and exceed expectations. We invite you to our Columbia dealership to experience our dedicated custom service first-hand. Our dealership is proud to service drivers from Chapin, Florence, Lexington, Irmo SC, and beyond. As Jim Hudson says, "Experience it once, and you'll never forget!" In the market for a new Audi? We have a wide selection of new, high-end Audi models at our dealership. Audi drivers from Florence, Chapin, Irmo, Lexington, and beyond, know there's nothing quite like the feeling of getting behind the wheel of an Audi A4, A6, Q5, or Q7. Whether it's your first Audi or have been a dedicated driver for years, Jim Hudson Audi Columbia invites you to our dealership for a test drive. The newest models are waiting for you! Audi fans with an affinity for the stays of yesteryear, or those looking for the luxury experience on a tighter budget, Jim Hudson Audi Columbia has the answer for you! Check out our used inventory and Certified Pre-Owned Audi inventory. Our used cars are high in quality and value, and our variety of luxury makes and models is sure to have something to please every driver. Your Audi requires proper care and maintenance. Our automotive maintenance and service center is an excellent place for those looking to have their vehicle serviced by a professional, certified automotive technician. In additional to servicing, we believe that all Audi Vehicles require genuine OEM parts in order to reach their full potential. We offer a wide selection or parts and accessories at our parts center. The finance department at our Columbia SC dealership is here to help you with everything you'll need to get started on financing your Audi. Whether you opt to lease or buy a new Audi, our professionals are here to help you fully understand your options. We are here to help you pick the absolute best financing solution. To save time at the dealership, we've provided an online finance application, which you can fill out at your own convenience. At Audi Columbia, we're the premier destination for new and pre-owned luxury models in the greater Lexington, Irmo, Chapin, and Florence SC area. We are pleased to offer a variety of services, finance, and lease opportunities, and so much more. Come by to learn more about our lineup, as well as the services we offer. Jim Hudson Audi of Columbia, located in Columbia, SC, will help you experience the progressive design, revolutionary engineering, and innovative solutions of all Audi luxury performance vehicles. As a proud member of Jim Hudson Automotive, family-owned and serving the greater Coumbia area since 1980, we are pleased to offer our customers a full stock of Audi models that are packed with the performance and high-end featured you expect from Audi. In the market for a new Audi? We have a wide selection of new, high-end Audi models at our dealership. Audi drivers from Florence, Chapin, Irmo, Lexington, and beyond, know there's nothing quite like the feeling of getting behind the wheel of an Audi A4, A6, Q5, or Q7. Whether it's your first Audi or have been a dedicated driver for years, Jim Hudson Audi of Columbia invites you to our dealership for a test drive. The newest models are waiting for you! 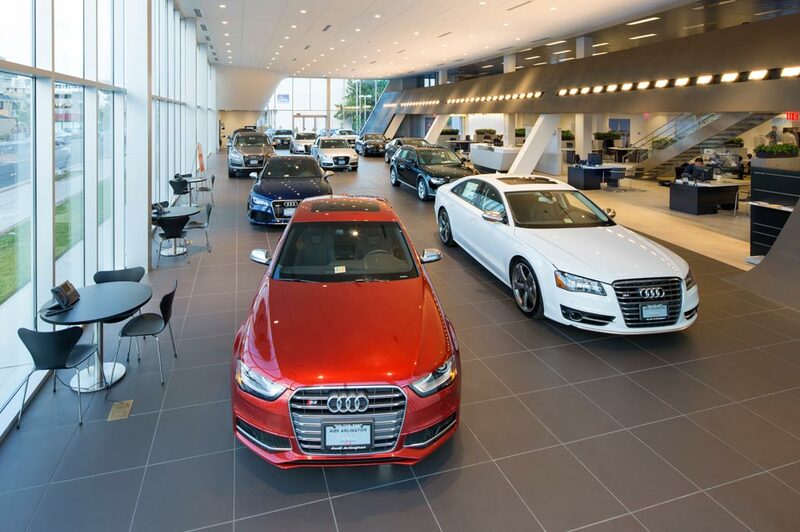 Audi fans with an affinity for the stays of yesteryear, or those looking for the luxury experience on a tighter budget, Jim Hudson Audi of Columbia has the answer for you! Check out our used inventory and Certified Pre-Owned Audi inventory. Our used cars are high in quality and value, and our variety of luxury makes and models is sure to have something to please every driver.